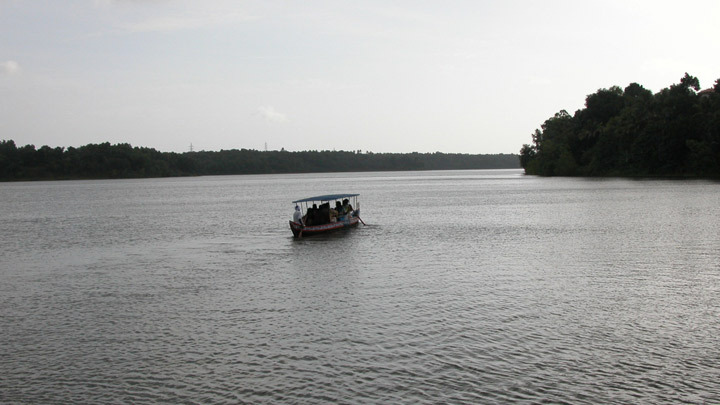 Sasthamkotta, situated about 29 km from Kollam town, can be rightly called the ‘Queen of Lakes’. This vast fresh water lake flanked by hills on three sides is the largest of its kind in Kerala. The ancient Sastha Temple, which lends its name to the town, is an important pilgrim centre. This temple dedicated to both Lord Ganesha and Lord Ayyappa is surrounded by hills and forests, and the monkeys inhabiting the premises are considered holy. The monkeys of Sasthamkotta are believed to be the faithful entourage of the ruling deity, the Dharmasastha and therefore they have a spiritual ambience about them. The monkeys are devotee-friendly, and the thousands of devotees visiting the temple take pleasure in feeding these monkeys with nuts and fruits.